Retail Price: $28.99 Log in for LOWEST PRICE! 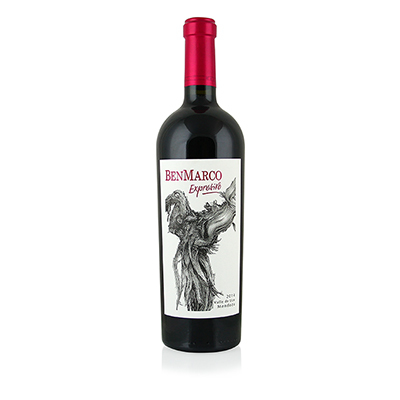 BenMarco is a 3,000-acre estate in the Uco Valley, a small subsection of Argentina's Mendoza region. The grapes for this rare gem come from a single vineyard, Los Chacayes, where the soil is so rocky that only grapes will grow there. The beauty of this soil is that you don't need to worry about any other plants or weeds competing for the sun or water. Winemaker and general manager, Edgardo Del Popolo, prides himself in doing as little as possible in the maturation of the vines and the crafting of the wines. It's kind of the less-is-more philosophy, which has worked quite well. The vineyard is about 3,600 feet above the sea, where the sun is brighter, the air cooler, the ground rockier. It's absolutely perfect. Contrary to popular thought, vines don't need a lot of water. But they need more than the zero rain that falls on Mendoza. Fortunately, they have the endless runoff from the Andes, so they are able to irrigate the vineyards with the perfect amount of moisture to produce the best grapes possible. And, the best grapes make the best wine. That is certainly the case here. The grapes were hand-harvested, so as not to bruise them like mechanical harvesting can do. They were brought to the winery and hand-sorted, so that only the most perfect ones were crushed. That care has produced flavors that are other-worldly. Black cherry, plum and spice mixed with French oak is pure heaven.